By Vuthisa Our prototype portable camping stove aims to highlight the plight of millions of people cooking on inefficient and unsafe charcoal stoves. It is not available for purchase yet. 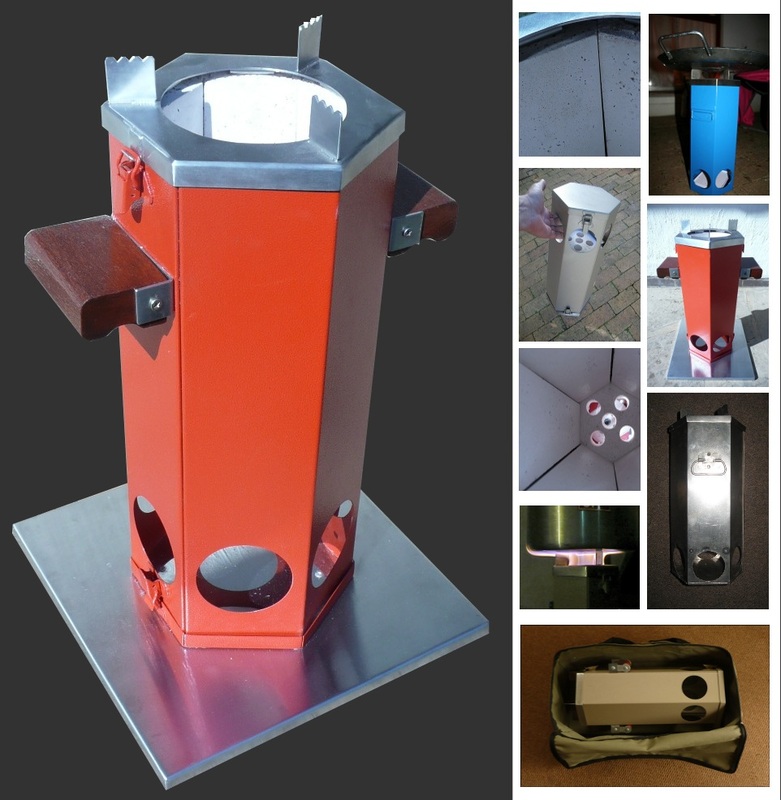 The camping stove will weigh less than 4 kg and consists of a easy-to-clean powder coated hex-shaped shell, containing a shock-proof low-density ceramic combustion chamber or insulated fire bricks. The top of the stove has a detachable potholder made from stainless steel and will come with an optional padded and waterproof carry bag with extra pockets for charcoal and fire lighters/matches. There will be a multitude of colors to choose from i.e. signal red, deep sky blue to dark gray. The base of the stove is also removable in order to shake out the ash after use. We propose the stove be used to save on electricity costs which are set to sky rocket. In South Africa, ESKOM (State owned power company) has applied to NERSA for a 35% increase per year for the next three years – a 200% increase from current rates in three years time. [***Update***24 February 2010 – The national energy regulator decided to fix electricity tariff hikes at roughly 25 percent annually for the next three years rather than 35 percent.] [***Update***23 March 2015 – A further 12.69% tariff increase will be implemented from 1 April, 2015 onwards.] The cost of operating this stove 4 times a week is estimated at R19 ($1.60)! This is at the current cost of R 48 ($4) per 5 kg bag of charcoal and using 500 grams of charcoal per burn. Of course it would be much cheaper to make charcoal in your own backyard. Please send through your comments to Vuthisa on our Contact Us page or visit the News link from time to time for product updates or visit our Home page.